Isn’t all maple syrup organic? This is a question we hear a lot. If all maple syrup comes from maple trees, what is the difference between organic and non-organic maple syrup? The answer is more complex than you might think. Farmers must meet the highest standards in the care of their forest and the land around it, treatment of the trees, processing of the syrup, and quality of equipment in order to be certified organic. Sustainable maple syrup production means care of the land and forest. To meet organic standards, farmers must care for the sugarbush (that is the forest which houses our farmers’ maple trees) appropriately. They are not allowed to use any chemicals anywhere near the maple trees for a minimum of 3 years before production can begin. This includes fertilizers, herbicides, pesticides, paints, and sprays. In addition to that, the land that the sugarbush is on may not be in contact with the land of a neighbor that uses chemicals. Buffer zones are required between the sugarbush and any potentially contaminated land in order to protect our trees. An inspector verifies the forest’s health by checking its ecosystem’s diversity. Twenty percent of the trees in the sugarbush must be something other than sugar maples. Farmers are required to have written forest management plans. These plans describe how this diversity will be maintained and promoted. They include Wildlife habitat standards, a plan for regeneration & growth, and promotion of biomass recycling. When the time comes to tap the trees, there are a variety of requirements that our farmers must follow. Trees must be healthy and capable of growth. Taps must be small in size and placed as shallowly as possible. This ensures that trees can heal easily and continue to thrive. The number of taps allowed is based on the size of the tree. Farmers may not exceed 3 taps in a tree. Leaving taps in trees is not allowed. Farmers must also place the new tap a certain distance away from the location of last year’s tap. The use of any synthetic paints, fungicides, antibiotics, fumigants, or sterilants is not allowed during any part of this process. Once the sap has been harvested, it is rendered down into syrup. All containers & materials used to hold the sap and process it into syrup must be food grade, undamaged, and lead free. During rendering, non-organic syrup producers will use a chemical defoamer to prevent syrup from bubbling. In organic maple syrup production, farmers are required to use only 100% organic oils as defoamers. 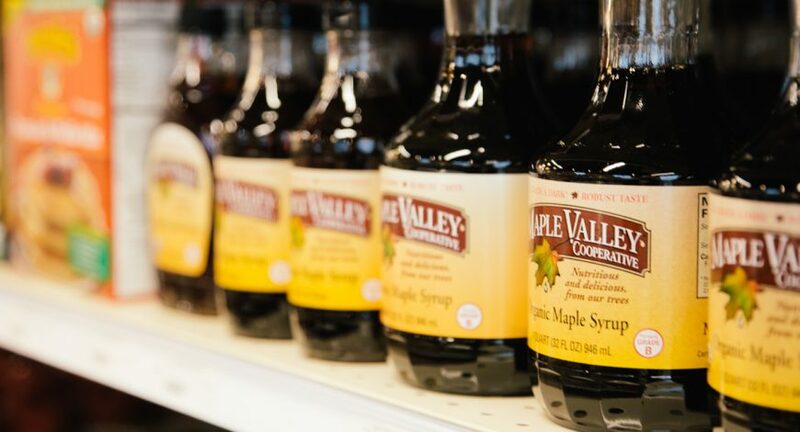 Maple Valley raises the bar even higher by ensuring that only 100% organic vegetable oils are used. This ensures that all of our products are vegan & allergen free. The maple syrup is sent to our facility in steel drums when it is ready to be sold. Here, we filter and bottle it. In order to meet organic maple syrup standards, we ensure that all equipment is food grade and is kept clean with only chemical free, environmentally friendly, cleaning products. The process required to meet organic maple syrup standards shows clearly the vast difference between organic & non-organic syrups. Only with organic certification can you be sure that your syrup was harvested using sustainable, environmentally responsible, chemical-free free practices. It is these high standards that we believe makes our maple syrup the best tasting maple syrup around.